Our commitment to quality and exceptional service make us your source for motorcycle tools and maintenance needs. 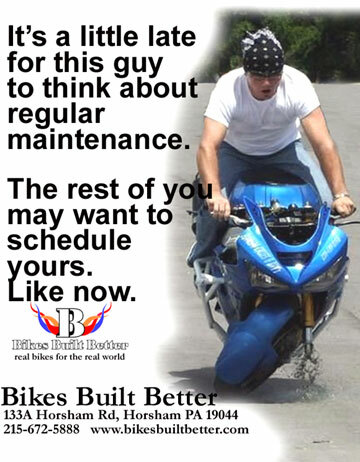 Bikes Built Better services all makes and models of motorcycles. We can handle all your regularly scheduled motorcycle services and our maintenance service usually exceeds motorcycles manufacturer guidelines. 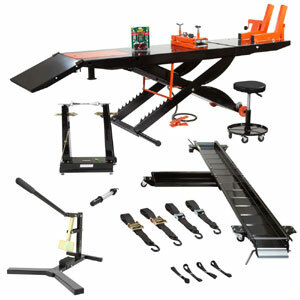 For those performing their own motorcycle repair and maintenance we can help you find tools lubercants and equipment you need to get it done right. Overall motorcycle care consists of more than periodic maintenance. Keeping your cycle clean and lubricated extends its life and helps with performance. 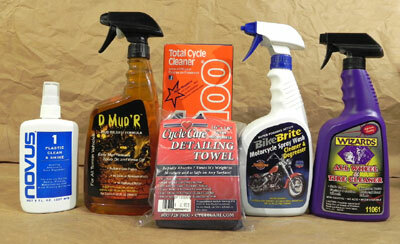 Check out the latest cleaning products to help keep your motorcycle looking spotless. Cleaning a motorcycle not only removes corrosive substances from important parts, but is also is a great opportunity for you to look over your motorcycle to identify issues. Protect your investment with top-notch cleaning products, designed specifically for motorcycle maintenance. We carry all the best brands including Amsoil, Mobil 1, K&N, Bel Ray, Castrol, Engine Ice...and many more! Our commitment to quality and exceptional service make us your source for motorcycle tools and maintenance needs. Service & Maintenance Tools, Accessories, Equipment, & Stands, Chemicals & Lubricants, Cleaners & Polishers, Transport & Trailer equipment.